Foley and sound effects by the incomparable Brett Maverix. 1996. John Howard wins the Australian federal election and becomes Prime Minister. While having his victory portrait done Howard, in a Dorianesque moment, wishes to become immortal in power forever while his portrait grows old and decrepit. However, a mysterious figure puts a hex on the portrait and the reverse happens: the painting gets better looking while Howard gets uglier with every evil thing that he does. So by 2007, the Prime Minister looks like Gollum. Worried about losing the next election Mr Howard goes ‘to the people’ but is beaten up during another Cronulla race riot, wakes up in hospital and, because of his head injuries, can only speak in Urdu. 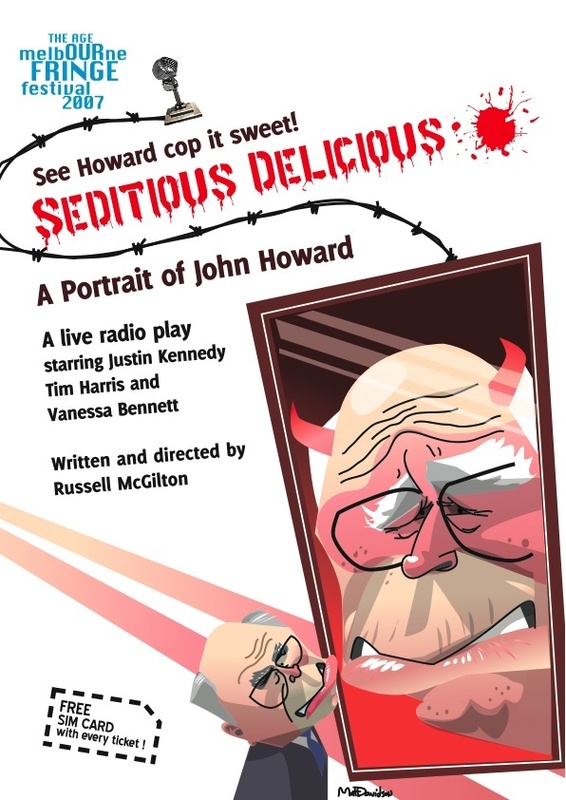 Fearing that he is a Pakistani spy Howard is whisked away by ASIO, air-dropped into Pakistan, captured by the American military, thrown into Guantanamo Bay and forced to share a cell with David Hicks who uses him as a commode. Recovering his command of English the guards, unable to bear Howard’s ‘awesome ordinariness’ a minute longer, help him escape. They send him adrift in a rowboat and it is in Australian waters that his boat is blown up by the Australian Navy. Months go by and Peter Costello is at last about to be sworn in as Prime Minister when Howard bursts in. He is rescued by a hardened gang of Queer and Alternatives and taken to the Gay and Lesbian Coral Sea Island and forced to sing ‘I am what I am’ by Gloria Gaynor. Meanwhile, Peter Costello has assumed leadership of the government and is having a fine time humiliating Alexander Downer. But then John Howard bursts into parliament and discovers that his portrait has become none other than Mr Costello himself. A fight ensures between Costello and Howard whereupon Howard is impaled on the Australian flag but still has the strength to destroy his own portrait…with a paper hole punch. This show has the claim to fame of being slated by Andrew Bolt!